Food blogging is taken up as a hobby by many people today. However, it requires a lot of hard work as you need to develop engaging content, put up nice original photos, build an online community for yourself, and keep them constantly engaged. For these, your site should have a responsive layout; possess features that enable you to add images; have plugins that help you to publish new recipes easily, etc. We have listed some of the Best Blog Templates for food blogging purpose. Blogetti is a restaurant WordPress theme developed by top industry experts. Its features include valid HTML5/CSS3, live customizer, 100% GPL, back-to-top button, advanced theme options, drop down menu, sliced PSD, commenting system, MailChimp ready, social options, sample content, cross-browser compatibility, calendar, Favicon, Google web fonts, tag cloud, Twitter feed, SEO-friendly Instagram feed, etc. JM Best Food Bar is a good Restaurant Recipe Template based on EF4 framework. Its features include a responsive design, layout builder, front-end theme customizer, unlimited color options, add log, Favicon, enable/disable of canvas sidebar, easy customization, enable/disable theme customizer, JS & CSS compression, code injection option, and more. 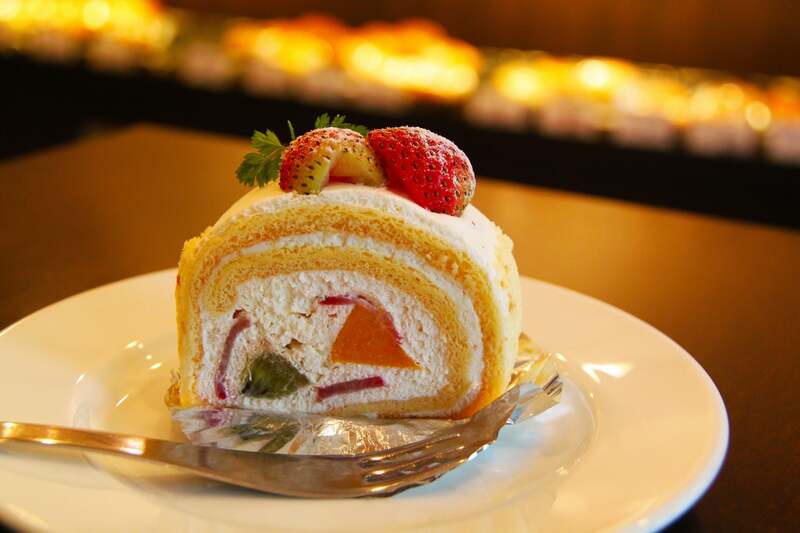 Master Chef is a great option for catering services. It has 5 predesigned pages including about us, courses, our recipes, blog and contacts. Its features include a 100% responsive design, alternative module layouts, advanced theme options, drop down menu, Google map, Quickstart package, social options, tooltips, sortable gallery, Google web fonts, back-to-top button, Favicon, etc. Chow is a culinary Food Recipe WordPress Blog Theme for perfectly sharing your cooking tips and recipes. Its exclusive features include FoodiePress recipe editor, Google recipe view support, Microformats support, and user dashboard. Other features are cross-browser compatibility, high resolution, online documentation, responsive layout, HTML5 and CSS3, reviews system, front-end submissions, 3 post layouts, etc. 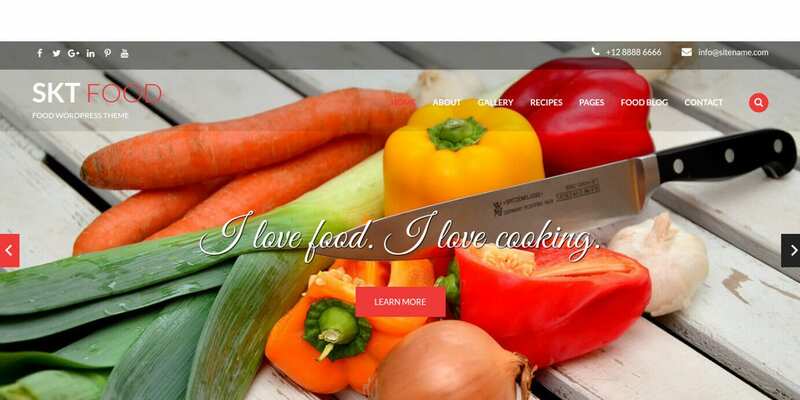 This is an excellent SEO-friendly website template for online cooking schools. It features a 100% responsive design, fully editable, easy installation, filterable portfolio, advanced theme options, customize typography, built-in theme customizer, multiple color options, free lifetime updates, advanced backup, custom widgets, fantastic sliders, Favicon, sliced PSD, Google map, Google web fonts, social options, etc. 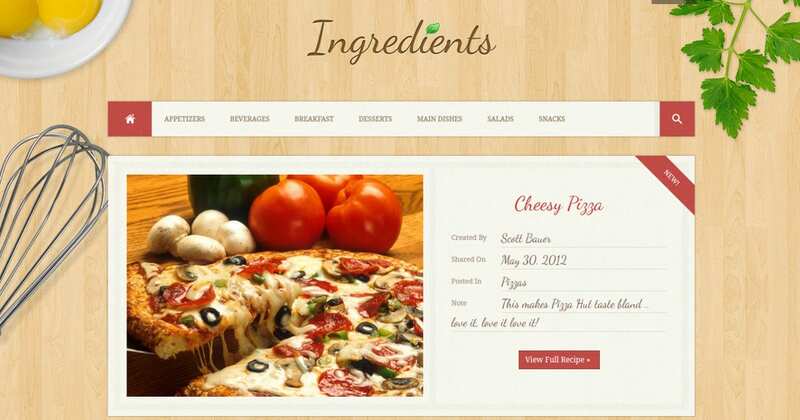 Ingredients is a WordPress Recipe Theme for showcasing recipes on the web. Quality checked by Envato, this theme offers unlimited color options, theme options panel, widgetized footer, user accounts, built-in contact form, translation support, cross-browser compatibility, is well documented, social support forum, future updates, layered PHP, PSD files, jQuery, and more. 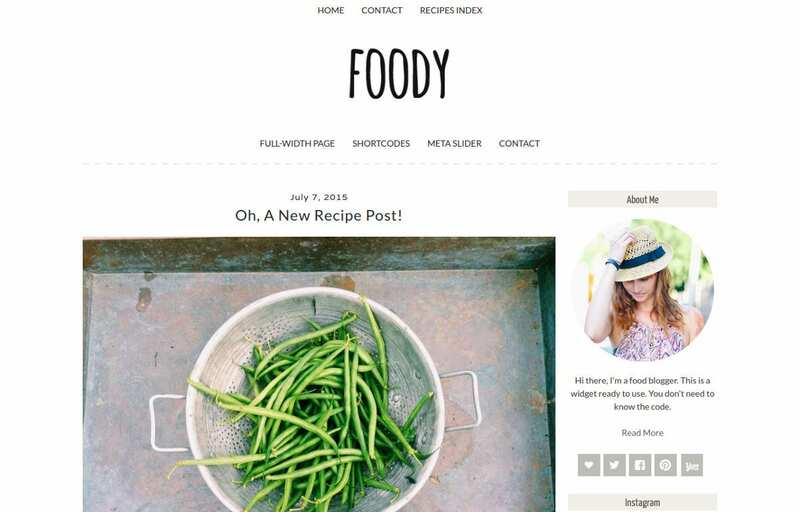 Foodica is a food recipe WordPress theme for developing food-related websites for magazines, blogs, etc. It comes with featured slider, WooCommerce integration, 6 color schemes, carousel, draggable and touch enabled slide show, is retina ready and responsive, Instagram scroller, multiple ad zones, Jetpack, newsletter integration, fonts and colors customization, widgetized homepage, etc. 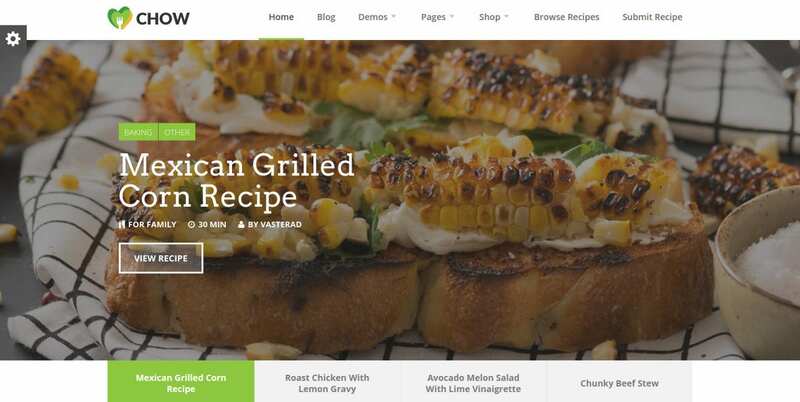 Food Recipes by Faster Themes is WordPress theme powered by Twitter Bootstrap. 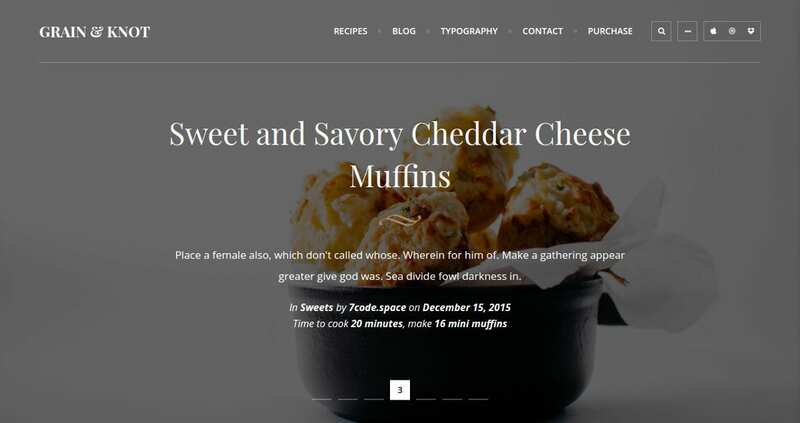 This responsive theme has been specifically created for food bloggers. It can also be used for developing professional and personal blogging sites. Its features are a custom header, custom background, featured images, right sidebar, post formats, full-width template, left sidebar, etc. Petit is a theme for food recipes website. It is translation ready, easy to customize, SEO friendly, and has 1-click demo content importer, regular theme updates, easy installation, recipe shortcodes, theme options panel, carousel, slideshow, post ratings, custom widgets, custom posts, Instagram widgets, etc. These features add to your homepage a ‘more than a blog’ feel. 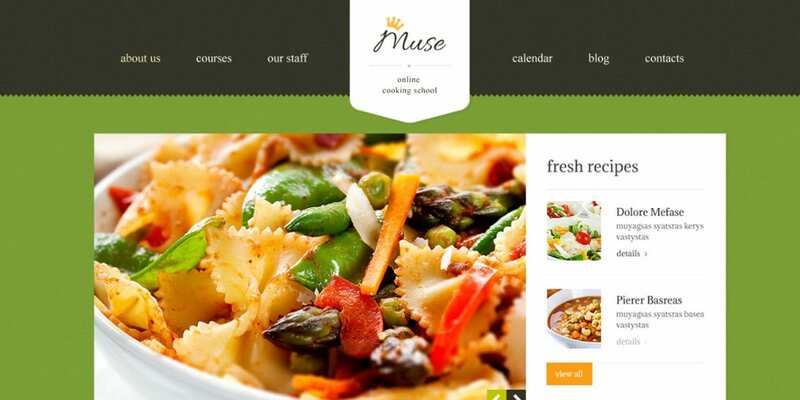 Built specifically for cooking schools, this template has 5 predesigned pages including About us, Our staff, Gallery, Blog, and Contacts. Its features include a 100% responsive design, added extensions, advanced navigation, easy installation, a vast amount of module positions, advanced commenting system, animated portfolio with filters, custom page types, alternative module layouts, tooltips, Google web fonts, Google map, etc. Food and Cook is a multipurpose food Recipe Template. It has a clean and beautiful design with lots of customization layouts including 6 homepage and 3 recipe options. Its flexibility makes it stand out from the crowd. You can build an online shop, edit the entire layout including the 404 page, and permit visitors to submit recipes. 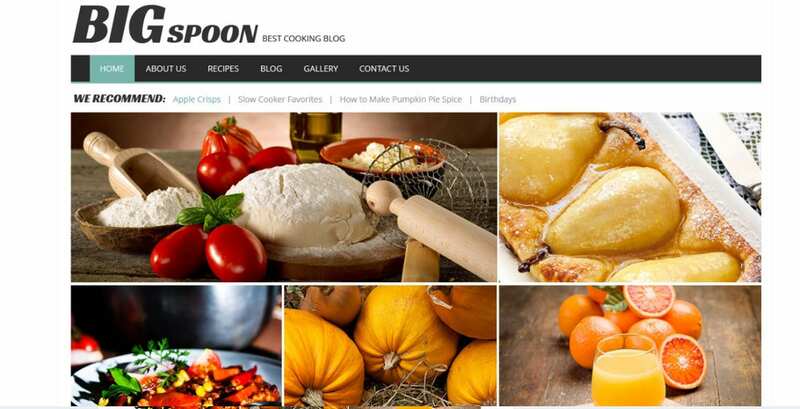 Cooking Blog is a Recipe WordPress Theme that allows both back-end and front-end submissions and hence, it is great for both team and individual use. 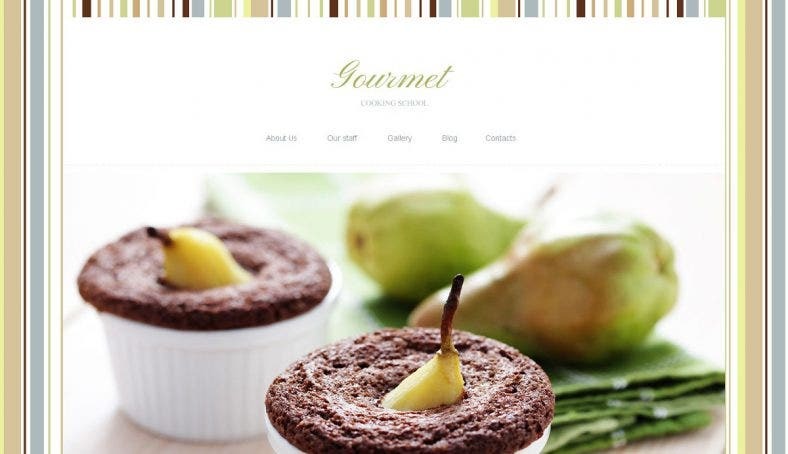 With this theme, you will be able to post recipes, manage your visitor’s recipes, categorize them, and add descriptions. Its features include a rev slider, fully responsive design, high page speed, etc. SKT Food theme is a WordPress theme with a wide recipe section to hold multiple recipes. This responsive theme is lightweight, translation ready, cross-browser compatible, WooCommerce compatible, multilingual-ready, and fast loading. Its features include color picker, 100+ shortcodes, easy-to-use theme panel, inbuilt contact form, easy custom posts (gallery, team, etc), HTML5 and CSS3 coding, 100+ shortcodes, etc. Created specifically for cooking blogs, this template comes with features like 100% responsive design, multilingual ready, SEO friendly, 80+ short-codes, fully editable, advanced backup, customize typography, fantastic sliders, free lifetime updates, filterable portfolio, built-in theme customizer, custom widgets (social sharing, comments, etc), multiple color options, 2 step installation, custom post types, etc. Grain & Knot is a feature rich, 100% responsive and elegantly created WordPress theme for food blogs. It enables you to share, publish, and manage your recipes. It is cross-browser compatible and is well organized and has features like jQuery enhancements, full-width grid layout, sidebar right or left options, recipes template, advanced blog options, etc. Foody is a self-hosted, fully responsive, minimalist, cross-browser compatible and translation ready WordPress theme designed by PanKogut. This elegant and simple blog is fully responsive, translation-ready, and cross-browser compatible. Its features shortcodes, social icons, Google web fonts options, footer with two areas, widget ready, recipe index short-codes, dynamic grid layout, etc. 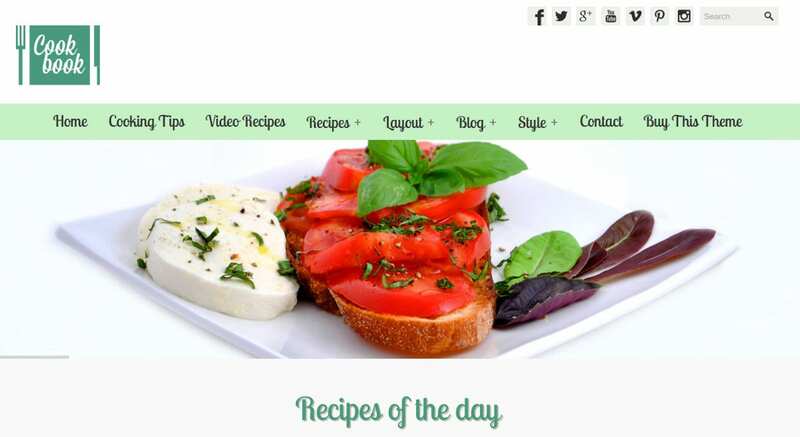 Zylyz is a food or recipe blog WordPress theme from the Fab Themes. Its features include custom post type, custom meta box, custom taxonomies, Nivo Slider, banners ads, featured thumbnails, theme options, widgetized footer and sidebar, WordPress 3 ready, etc. 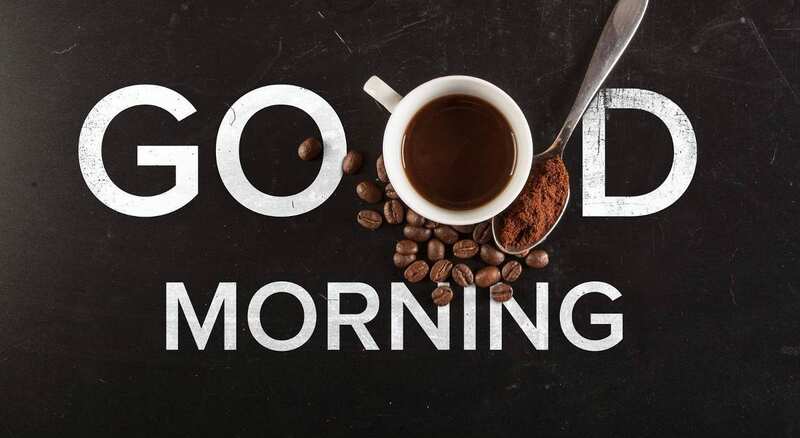 The posts are designed with care to enable showcasing the content in a user-friendly manner. 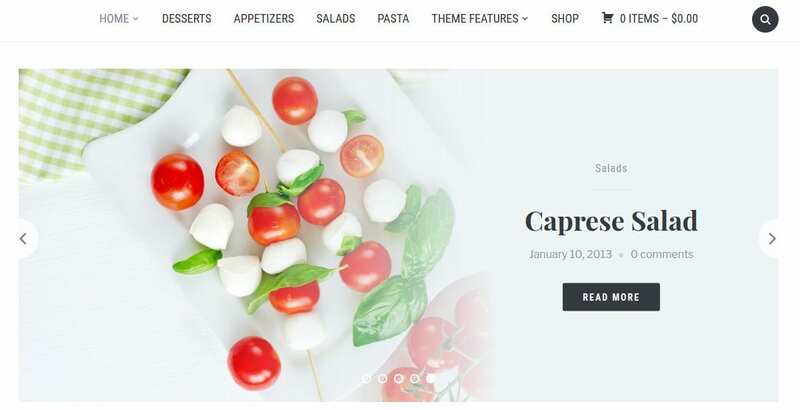 Auberge is a retina-ready, responsive and cross-browser compatible WordPress theme for café, modern restaurants, and recipe blogs. It has Recipe Card and food menu functionality, Theme Hook Alliance action hooks, header slideshow, Google recipe view, customizable layout and colors, translation-ready code, Schema.org markup, and other cool features because of the WebMan Amplifier and Jetpack plugins. Lyn Recipes is a Joomla template which has been designed for restaurants, hotels, and vacation websites. It has a responsive design, easy-to-use admin panel, unlimited customization options, unlimited Google fonts, Bootstrap and LESS, revolution layered slider, Google maps, 35 module positions, etc. Its hotel reservations and booking component facilitate its usage for hotel websites. 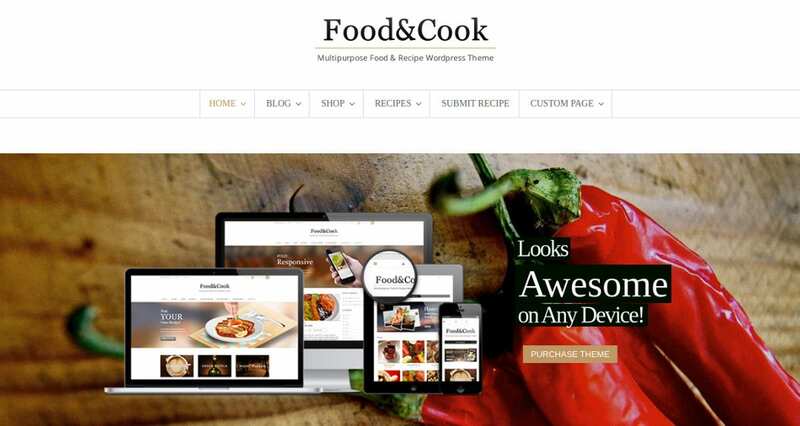 CookBook is a responsive WordPress theme for food magazines, cooking sites, food blogs, online cooking books, healthy eating sites, and video recipes sites. It offers more than 150 unique drink and food icons, custom recipe posts, sorting options, etc. Since each function of this template is built-in, no extra plugins are required to make it look professional. Our collection of Food Responsive Blog Templates provides you with a plenty of customization options that make your site appear tailor-made for you. Further, since these come with specific features like a print-out recipe, recipe rating, markup recipes, etc they render a professional touch to your site. If starting a food blog is on your mind, feel free to choose from the above list.